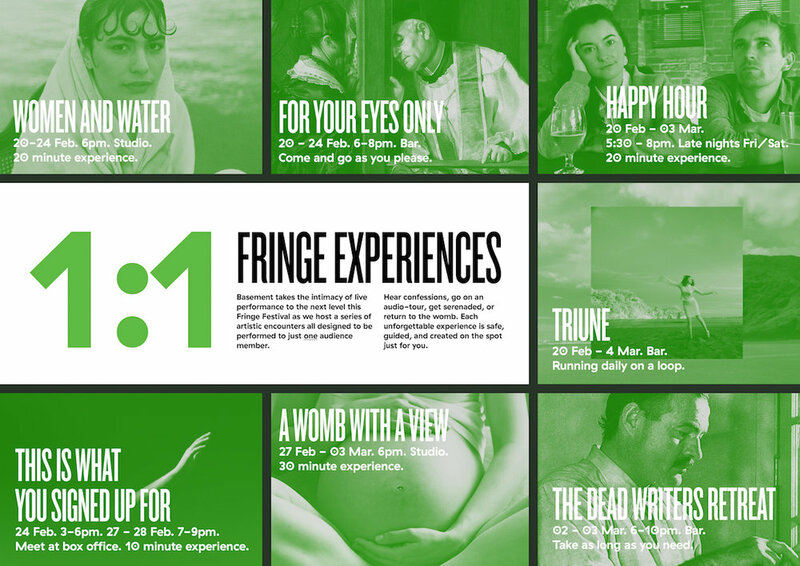 This Fringe festival Basement are taking the intimacy of live performance to the next level as they host a series of artistic encounters all designed to be performed to just one audience member. You might hear confessions, return to the womb or have a night out, but as different as these unforgettable experiences are each one is safe, guided, and created on the spot, just for you. The one on one shows will be working like clockwork so please arrive 10 minutes before and check in with the box office so you don't miss out on your experience. For Your Eyes Only 20 - 24 Feb. 6 - 8pm. Women and Water 20 - 24 Feb, 6pm on. Binge Culture's Happy Hour 20 Feb - 03 Mar, 5.30pm on. Triune 20 Feb - 03 Mar, 5pm on. This is What You Signed Up For 24, 27 & 28 Feb. 7pm - 9pm. A Womb With A View 27 Feb - 03 Mar, 6pm on. The Dead Writers Retreat 02 & 03 Mar. 6 - 10pm. CONTEMPORARY PERFORMANCE & LIVE ART!